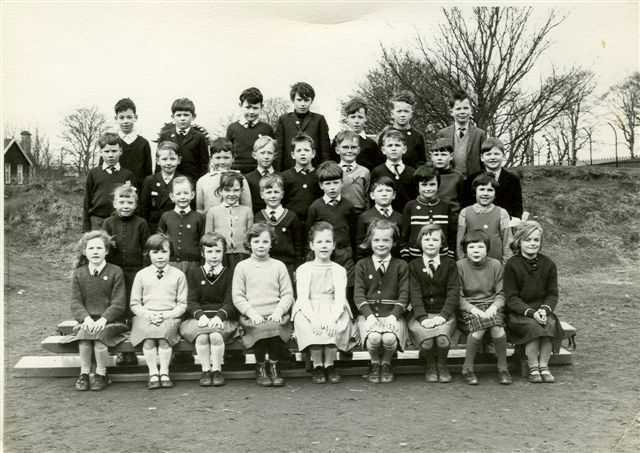 This is a Class picture 1962/63 aged five. I attended the school up by the railroad station - primary 1,2,3, etc. and then went down the hill from the old school where I attended up to primary 7. The teacher was Mrs. Wilson until I left for Canada with my family - May of 1969. In the picture I am in the third row, fourth from the right - the one with the glasses. The tall guy in the back, centre, is Gordon Knox. To the right of me, as you look at the picture is Robert Cavity. In the front row, again as you look at the picture, second from right is Freda (don't know last name). Next to her, I believe, is Elaine Ross, my school sweetheart until I left for Canada, age 12. The other name I recall is Tumphe Kennedy. Pardon the spelling of the names if they are incorrect. Michael, I can fill in a few names for you. Front Row: L-R ?, ?, Lorna Mitchell, ?, Alana Ritchie, Carol Lane, Elaine Ross, Freda Lohse, ?. Second Row: Ann Miller, ?, Jacqueline Fraser, Fraser Moir, ?, ?, Wendy Connell, ?. Third Row: ?, ?, ?, Kenny McCormack, Ross MacDonald, You - Michael Coghill, Robert (Cavity), Gunther Lohse, ?. Back Row: Apart from Gordon (Knox) I don't remember the names of the others. Michael, I have thought of some more of the names in your class - funny how they come back to you. Second row, third from right is Sinclair Sutherland and third row, on the far right, I think is Alec Hercher. Front row, far left, is that Ann Lyall?? - and on the far right, is that not another of the Herchers? I don't know if you remember me, we lived in the High Street at the same time as you did, though we were further down, next to the Marine. My Dad was a postie, Cameron Maclennan, your Mum & Dad will certainly remember him. Your sister Maureen was in the same class as my sister, Pauline until you left for Canada. I remember she was going out with Roy MacGregor just before you emigrated. When you were in King George Street, we lived in Queen Street and then Seaforth Crescent. My mum still lives there but sadly my Dad passed away in 2001. I also remember your uncle George, brother of your Mum, Louise. And of course your Dad. I think he was back visiting in Invergordon a few years ago, and I caught a glimpse of him in the Marine though it must be more that 12 years ago now. My Grandad and uncle Bill worked in the Slaughterhouse at the bottom end of the High Street. Do you remember that? Sorry for waffling on, but I am a sucker for nostalgia and family history and stuff like that. Just found this site ... Michael Coghill !! haven't heard anything of you since '69. I hope you and all your family are well. 4th row = Willie Ried, Glen Stebbins, Iain Palmer, Gordon Knox, Graeme Askew, Roy MacKay, and last but no means least is Peter Ross. Graham Dingwall is missing from the class photo. I am sure I know the other names and will update when my memory clears. The two missing names are Catherine MacKay - front row 2nd left ; and Haig MacArthur - third row 1st left. Third row 2nd right is William Lohse, not Gunther, and it is a P3 photo from 1965. This website also has the P5 and the P1 photo from 1965 (which was obviously taken on the same day going by the background). It would good to see the other photos from that day appearing on here. Thanks to Kenny who directed to me to the website which I never knew previously existed. Excellent reproduction of photo too with Kenny's memory as sharp as ever filling in the blanks. As a now "older" Invergordon boy I continue to take a vested interest in all things past and present. I remember well when the Coghill family left InverG - have memories of us playing with our "Action Men" which was the boys "in-toy" of the time not long before you left. Glad to hear you're well though would not have recognised you - Kenny did issue a challenge with your photo. Did often wonder where you ended up. Somebody told me you had joined the Canadian Army but obviously wrong. Did your sister not join the RCMP - thought I read something along these lines? I remember your father worked for Munro's Garage as a salesman? I have an even older Primary 1 photo which I will endeavour to have scanned in at some point. Interested to see Jackie's comments, who I think is in fact a distant cousin of mine. I now stay up in Bonar Bridge but work in Inverness. Best Wishes to all. Graeme, you and I are definitely distant cousins. Your grandmother, daughter of Norrie Maclennan, and my grandfather, son of his brother James Maclennan, were 1st cousins. Also, your dad and my dad worked together as postmen in Invergordon for many years. They were 2nd cousins and you and I are 3rd cousins!! I stay in Staffordshire now. Wow! That brings back memories! With a class size that small why didn't I learn more? Unfortunately my last visit to Invergordon was to the funeral of my beloved mum last January. A desperately sad occasion. However, there were lighter moments, my old friend Willie Reid made the effort to come and pay his respects at Mum's funeral and we actually met for the first time in 28 years! Then Willie -as only Willie can- took myself and another old pal Rob Mcvite (purely for my benefit) for a guided tour of the sights, including visiting Sinclair Sutherland, another ex Munro's garage apprentice. It was great to see them all prospering some with family and bairns (in Rob's case grandkids!). We talked about the some of my old pals - as you do - and I'm sorry I didn't have time to see Michael Zag and Kenny Mcormack, Dinger or Gordon Hearn. However, as they never say in England "The crack was good." I've just handed in my notice to the RAF after 28 years, so I've a year to go then I'm coming out to run my own personal training consultancy with my wife. I hope I do get to see my old comrades again - hopefully I will as I still keep in close contact with Graeme and we will be popping up to see him next year. Perhaps a get-together with a dram or two will be in the offing? I came across this by chance. Brings back memories as I taught most of this lot in 1968 for a while when a supply teacher. Have slides of the class that include two girls not in this photo: Elizabeth Pople and Fiona McNair. Hello Mrs Nour - I remember you from our P6 class. If my memory is correct then you were pregnant when you taught our class. There were several new pupils joined our class between P3 and P6, the two you mention and a couple of others. I wasn't pregnant when I taught the class but did have a very young baby at that time. My mum is the second row from front, far right - Marie Westphal, but now Marie Dunkley. Hasn't changed! Hello Peter Ross, often wondered where you were. I'm still living in Invergordon, have 2 daughters and 2 grandchildren. Still see quite a few of the faces in the photo. Heard we were having a school re-union years back but nothing came of it. Maybe see you next time you're in town. Anne, lovely to hear from you after all these years, I hope you are keeping well. I think a school re-union would be fun - I wonder if we'd recognise each other? Hi all, like Peter I think it would be great to have a re-union of some sort - most classes above and below us seemed to have it about age 40! Maybe now we are all around about age 50 that we have one. I have a copy of our Primary One photo which I'll have scanned and submitted when I'm home later this month. Regards to all. After all these years just noticed that the photograph is the wrong way round! Correct me if I'm wrong but the old air raid shelter which we used to play on and over which forms the backdrop was on the east side of the rear playground ie backing on to "The Cromlet" and the Tanks fence should appear on the left of the photo, where in fact it's on the right in the photo. The photographer must have had a bad day and reversed the negative as my original school copy is the same. It’s Graeme’s big Sis here and he is 50 on 27th April 2007. So perhaps you should get that re-union organised! Good to see so many names I recognise and hope to see Peter some time he is up. I live just outside Linlithgow since 2001, but still get the craic from up north via my daughter Kerry Adam. Hi all, I've just seen this picture for the first time in about 30 years and my memory can't be too bad as I remembered everyone. Must confess I haven't seen or spoken to the vast majority of people in this photo for probably more than thirty years, some not since we all left school. I talked to Graeme Askew up at Shin Falls a few years ago and I used to see Ann (Wilkie) when she was at the golf course with Ali but hardly anyone else. The chances of me meeting anyone now have lessened considerably as I now live in Perth, Western Australia. Maybe there's more chance now!! I moved here in January with my wife and two children. I'll be sorry to miss the reunion if it ever happens but how come everyone's 50 when I'm only 39!!! Mrs Nour, do you remember the story of the mountaineer Rudi Matt? I do, as if it was yesterday. That wee gem of a story was the impetus for me to become a mountaineer and a mountaineering instructor. I still climb to this day. Isn't it amazing how a story could influence a 11 year old laddie. Hi everyone - I joined this class in primary 3 - I remember Mrs Nour very well - and the story of Rudi Matt. I moved to Vancouver BC Canada in 1984 after a few years in Edinburgh and then London. I remember most of the names - but it is over 30 years (help!) since I left the north. This certainly brought back many memories - I also remember very well the Victorian project we did in P7, and learning decimal money! I do occasionally hear from some of the people from high school years.... including Jackie Ross (Fraser). Blimey, Liz Pople, there's a blast from the past, as they say. It never ceases to amaze me just how widely everyone from my school days have spread themselves throughout the globe. Mind you the opportunities in Invergordon diminished considerably when I was growing up, thus the decision to leave - though I would come back for a reunion! Hi Elizabeth. Glad to hear that you are well and I often wondered where our former class ended up and what they are doing now. If my memory serves me right your father worked for Munro's Garage? Did you leave Invergordon when he took a post with Sutherland Transport in Lairg or am I getting mixed up with someone else? I will get around to getting that P1 photo submitted one of these days. Hi Graeme - you are correct - my dad was at Munro's - we moved to Invergordon from Lairg in 1965. He stayed at Munro's till he retired. Then about 20 years ago they moved to Somerset. I moved to Edinburgh when I went to Heriot Watt then I worked at Scottish Widows for 5 years before getting married and moving to London. We've been in Vancouver for 21 years. I haven't been north of Aberdeen since we left the UK - but maybe one day we will get back up there. Enjoyed reading all the comments and in reference to a reunion there may be one on the cards for June 2010 depending on the response. In November 2009 some of the girls got together at the Kincraig Hotel but it would be nice to broaden the invitation and hopefully gather as many as possible. Academy pupils and teachers would be included as well. Graeme Askew, you should be a very organised …em.. person (can't say man as I still think of us all as non grown ups) and I 'm sure you can help organise if you have time. Lorna Mitchell, Morag Ross and myself were nominated to give it a go but the more that contributes the better it should be. Willing offers will be gratefully received. I remember Mrs Noor with fondness and her two little girls Laya and Soraya I think. I loved when she read out that story to the class. She made us feel grown up and was a fabulous teacher I thought. I really enjoyed her class. Michael Coghill, I have often wondered what you ended up doing when you left school. I'll never forget your blue band and sugar sandwiches or your Action Man that may well have been be a treasured antique now if it wasn't for the fact that you used to launch him out of your bedroom window to see if his parachute would work. Plastic sandals and Chicco your dog I also remember well! I met up with Maureen some years back when she visited with her two girls. I had to rush off somewhere so didn't have as long a catch-up as I would have liked. If any of you wish to respond to the planned reunion then please let me know your thoughts and suggestions so that we can set the ball rolling before we all get any older and forget. Peter Ross wash your mouth out with soap - 50s indeed! The only response I've had is from you, Alistair and Michael, so looks like it will be a cheap round. Hope you are well. Hi Elaine and all. Firstly I am flattered that you think I am an organised 'person' and yes you did hit the nail on the head as inside still very much the boy! Not wishing to slope shoulders as Peter puts it I am working out in Abu Dhabi in the UAE and probably not best placed to organise a reunion from here but would be happy to assist in any way possible and I would certainly make the effort to attend if there was sufficient notice. I am not sure if everyone has seen picture #1336 which I submitted recently - our old Primary One photo from the Cromlet. Just to evoke even more memories, good and bad! It would be great to hear how everyone progressed although perhaps this great website is not the best forum or use of it. All credit to Malcolm. Best regards to everyone anyway. Elaine, I'm very well. I'd love to come to a reunion. Give me an excuse to do some mountain biking and climbing in God's country. Give my regards to Edmund. Michael Coghill is my cousin whom I've not seen since he moved to Canada. I'm Linda Wareham, his dad's sister Ruby's eldest and I kept up with family news while his mum, Auntie Louise was alive and now I have bits of information from Auntie Jessie in Thurso when I'm in touch. Thank you Peter I haven't been on this site for years and I hadn't seen your coment. Edmund says thank you and he says Hi back. I hope everyone is still doing ok since it seems a while since any of us has added anything. It will be a big year next year for us all. Think Peter Ross is my cousin; my maiden name is Barbara Smith. My dad was your uncle David; hope you keep well. Yes Elaine, I've just turned 60. On the same day as Ann Miller, as I recall. Still self-employed in the fitness industry (www.peterossfitness.com) Whatever happened to the reunion? I've only come back to this site because Graeme alerted me to a relative I've never met. I hope yourself and Edmund are keeping well. Could 2017 be the year. Has anyone in the picture moved to Canada? Yes Michael Coghill is in Canada on Vancouver Island.